The Tablet & Chromebook Charging Cart that comes fully assembled that holds 16 Tablet/ Chromebooks and comes with a Traditional lock and Key System with a set of two keys. The dimensions are 12"W x 23.25"L x 34"H and Weighs 61 Lbs. Bottom shelf is perfect for storing accessories and equipment ( 3 1/4" H of top clearance ) Rear access door has a 16 outlet electrical assembly. Electrical cord can remain powered through a cord pass hole. Plenty of ventilation allows air to circulate freely through the unit. 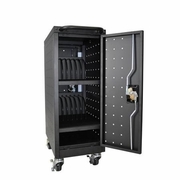 Each rubber coated divider is 1" apart to keep your equipment organized and protected.